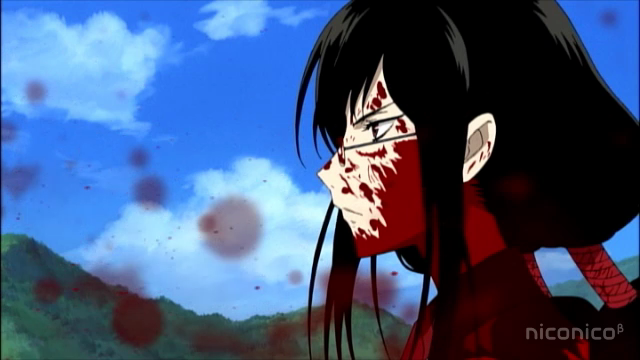 Saya, covered in blood, as usual. Episode 7 of Blood-C follows up on the shocking events of the previous episode in the sense that the town is largely deserted; the only ones out on the street are police (and Saya). It also provides a tiny bit of background on the mysterious dog-like creature that Saya has been seeing. Finally it ends at another surprising reveal. 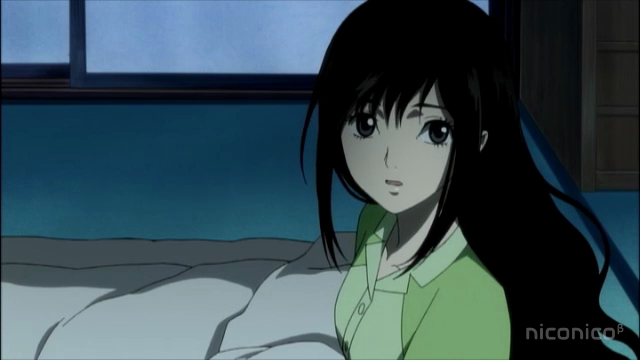 Saya, unusually blood-free and without her glasses. Saya is having flashbacks more frequently now, and the dog-like creature’s question (“who did you promise”?) seems to be bothering her quite a bit. Talking with a dog who claims to be the owner of a shop that grants wishes. 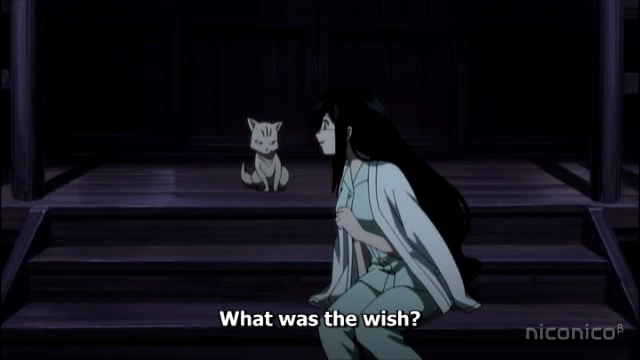 Saya goes outside because she can’t sleep and she meets the dog-like creature, who says he is with her because somebody made some wish, but he won’t say who or what. The dog’s seiyuu is Jun Fukuyama, who also voiced the owner of a wish-granting shop, in XXXholic. Whether this is a true crossover or just a reference to the other CLAMP series, many in the aniblogiverse seem angry. I think people are just looking for a reason to hate on Blood-C. Is it really that big of an injustice? CLAMP make inter-title references, and SHAFT zoom in on eyeballs. Get over it people! Miss Kanako Tsutsutori. Teacher sure has some crazy ideas. The next day Saya heads out and has breakfast at Fumito’s as usual. After that the background painting seemed to come in and out of focus. Saya goes to school, but no other students are there. Classes have been cancelled because the twins are still missing. Kanako is there, however, and she says flat out that she thinks the twins were eaten by monsters. 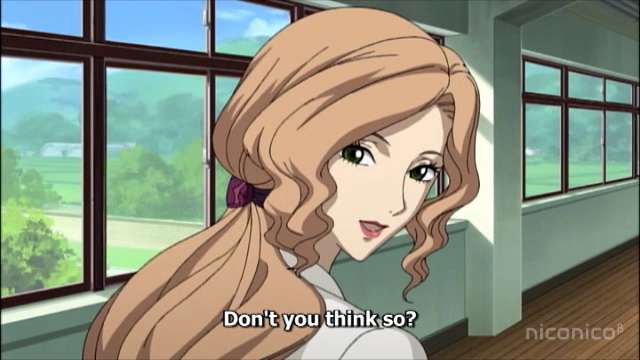 She was pretty suspicious before, but here she is clearly trying to provoke Saya into saying something about the Elder Bairns. The question is why. The monster seems to know her and her dad, but oddly not her mom. Eventually Saya gets attacked by a monster. This one seems to be saying that it fought her before. 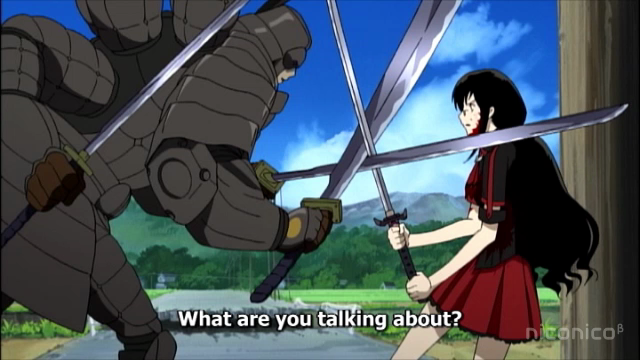 It talks about her “old self”, and it mocks her for thinking the sword is a holy relic. It strongly suggests that her father has been lying to her. By the way, Karakuri’s post on Metanorn includes a recap of the narrated scenes with the blood ampules. They still don’t make sense to me, but they, together with the dog-like creature’s remarks about wishes and who she promised (as well as whatever her father is hiding from her) seem to add up to the core of the mystery. 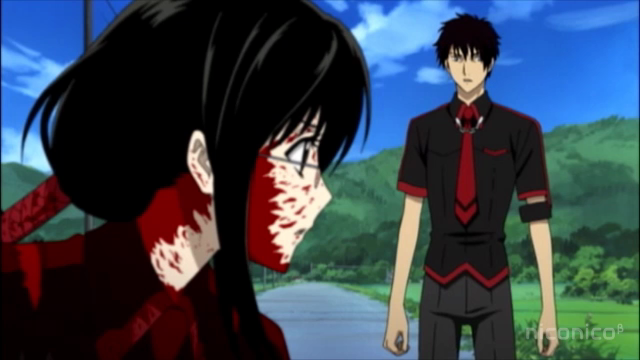 Shinichirou Tokizane finds Saya kneeling in a pool of blood. What this? Hah ha! This isn't suspicious at all! Perhaps the most important reveal of the episode: the dog-like creature and Tokizane appear in the same shot. So Tokizane is NOT the dog-like creature. 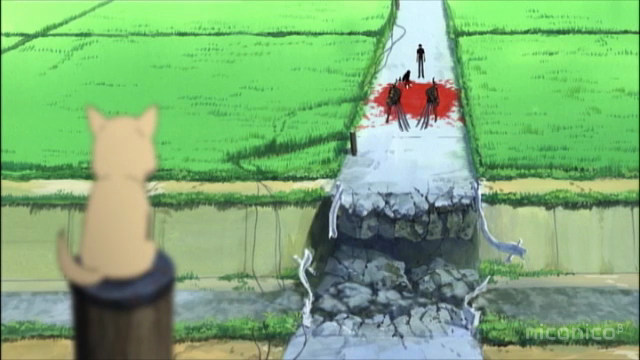 I wonder how he will react to seeing Saya covered in blood and carrying a sword. Did he see her chop that monster in half? Is he a good guy or evil? Definitely an interesting point to end an episode. 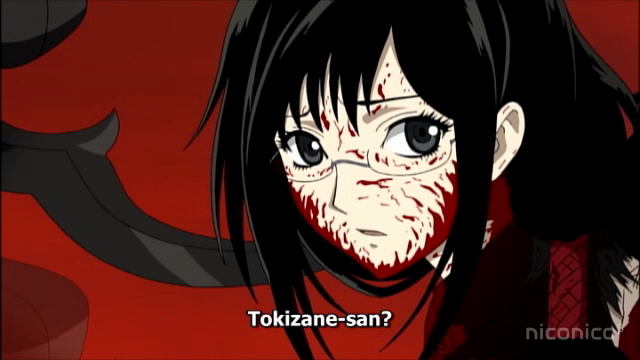 Maybe she’s the Saya from Blood+ itself? O.o This is getting so complicated. Typical of CLAMP to do this. And Watanuki!! I should have guessed! Yes. I like it complicated, though. I suppose I’m one of the few that thinks this has been an interesting series. Even when it seemed like nothing was happening, it had me intrigued as to why. I guess that makes me a CLAMP fanboy. So be it. Hahaha true. Even I’ve been a CLAMP fan since I was nine.But still…have to wait till next week now to watch what happens.